Bless me father for I have sinned. It has been two full years since my last confession...on the state of Purdue football. I feel I must do this because the Big Ten scheduling gods have removed Purdue from Michigan's schedule in the coming years, so it may be three years or more before I travel again to West Lafayette. Two years ago, I expressed my malcontent with Ross-Ade stadium's classless scoreboard jargon, the Braveheart, Jaws, and Godzilla movie clips, the odd "Boiler Up!" chant, and the train whistle. I told you of the separate seating arrangement for the away fans, and the poor concessions and other facilities accompanying it. I maligned the all-khaki uniforms, and the late arriving crowd. I thought maybe, just maybe, something would be done about it. I cannot be the only person that has seen these problems. I arrived at West Lafayette on Saturday with the best of expectations. The rain stopped just short of our trek to the stadium for kickoff, and the long walk, though the exact same as two-years ago, seemed shorter and less uphill than I remembered. I was only verbally accosted by one Purdue fan, but he and his group of "Ann Arbor Is A Whore" t-shirt wearing followers were weak, attempting only to get me close enough to him so he could fart on me. Fortunately for both of us, he did not succeed in his efforts. Arriving at our gate, we found a long line to get in. All Michigan fans. All being corralled into a single gate, on our way to our high school bleacher end zone seat...and again...not allowed into Ross-Ade stadium. Then the whistle blew signifying the kickoff. 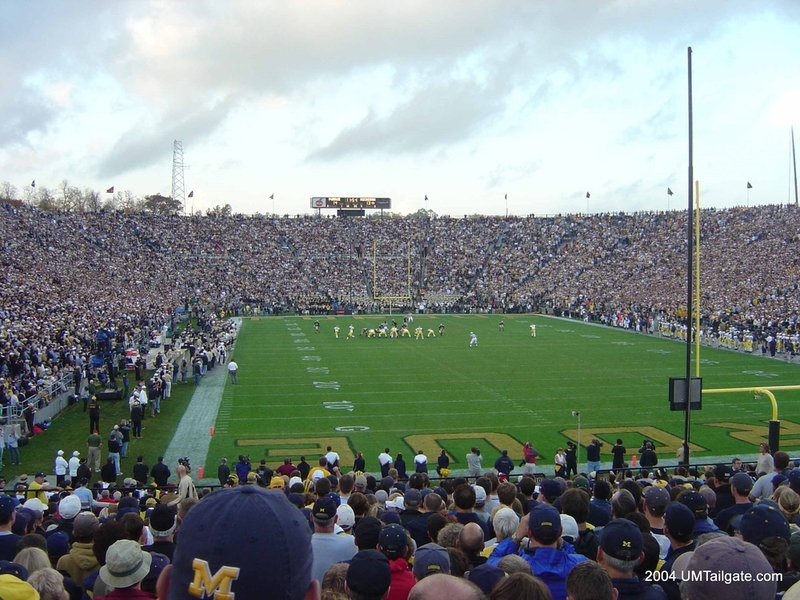 On Michigan's first drive, 3rd down came and prompted a scene from Jaws on the video screen...an obvious throwback to Purdue's rich tradition as a marine biology school. Then on Purdue's first possession, a scene from Braveheart...obviously honoring the great respect for the Scottish revolution in the state of Indiana. Nothing was fixed. Well, almost nothing. They scrapped the khaki uniforms, and the whistle didn't blow as much...but that was more a tribute to the Wolverine defense. But another problem was quite evident on Saturday. It was quiet. The quietest it's been in West Lafayette. I actually heard Chad Henne's snap count. A quiet crowd can sometimes be the product of success. You've seen it often in Michigan stadium. But this just in...Purdue hasn't been successful. If seasons were five games long, they'd have an arguement. But talking National Championship and Heisman trophy after playing five games can only result in one thing...disappointment. And perhaps that is why Illinois made more third down noise in our game last week than I heard this week at Purdue. This is despite the fact that Illinois hasn't won in the Big Ten in two years, and they don't have a short fruity film featuring one of their players that appears on the screen prior to third downs saying MAKE SOME NOISE...like Purdue. The Wolverines tried very hard to give Purdue this game. Our offense, who moved with reckless abandon from the 20 to the 20, just refused to put it in the end zone. We missed a field goal, had a field goal blocked, threw an interception in the middle of a good drive, and put linebacker Scott McClintock on a running back that was split wide left. We amassed 394 total yards...but only put up 16 total points. I think somewhere deep down we wanted Purdue to win this game. But Mike Hart is so young, he didn't get the message, so he decided to single-handedly manage the clock. In the process he gained 206 yards on 33 carries and had 3 receptions for 22 yards and a touchdown. Michigan's Teen Beat cover boys, Henne and Hart, outperformed the senior tandem of Orton and Stubblefield. The defense that kept Purdue in check for the entire game finished it off, forcing a fumble on Purdue's final possession, giving Michigan the 16-14 win. Michigan remains undefeated in the league and has won 6 straight, including two wins over then-ranked teams. But they remain stagnant in the polls, a product of having young talent and a horrible early season loss to Notre Dame. Well Purdue, see you in 2007...when Henne and Hart are seniors. I will now say 2 Hail to the Victors and 3 Yellow and Blues. And I promise to be at church every Saturday. Michigan Agricultural College is warming up the land grant tractor and heading our way. Game preview will be available on Wednesday. The theme for the October 30th game will be Texas Barbeque, and we will also be frying turkeys. Sister Kristen is unavailable for the week, so contact me for questions, suggestions, comments regarding the theme...webmaster@umtailgate.com. 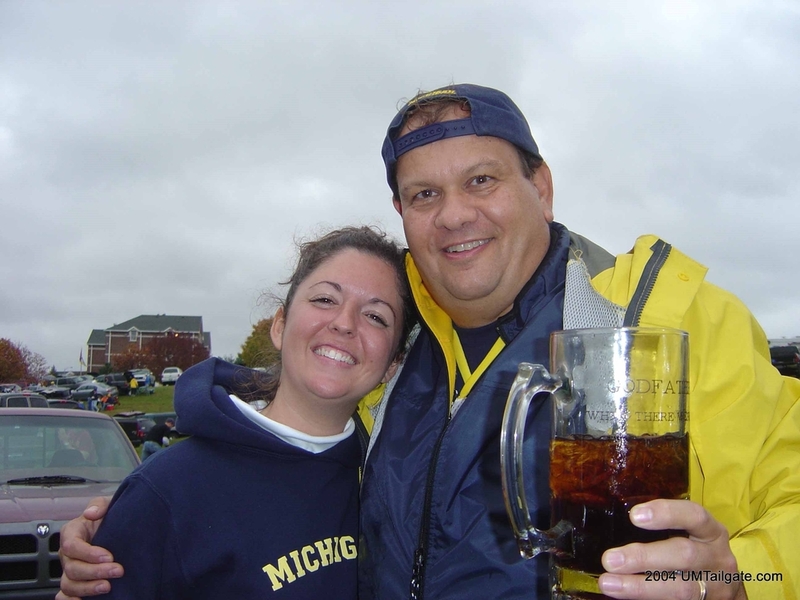 It will be a event-filled and historic tailgate, as we will be inducting our 5th member into the UMTailgate.com Hall of Fame. Our inductee's identity is under wraps, only the founding fathers and some key members of the UMTailgate.com group are in the know...so it should be an exciting surprise.